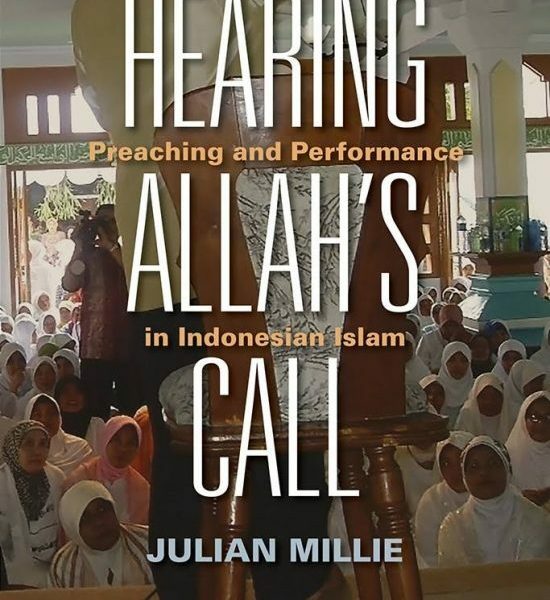 Cornell University Press has just published Hearing Allah’s Call: Preaching and performance in Indonesian Islam, written by the Monash University anthropologist, Associate Professor Julian Millie. Anthropologist Birgit Braeuchler interviewed Julian about his new book. Birgit Braeuchler: You spent 14 months researching with Islamic communities in West Java in preparation for this book, which must have been full of preachers, simply based on the fact that there are so many Muslims in that part of Indonesia – about 40 million in a province not much bigger than the island of Hawaii. But let me ask…the title of your book emphasises performance. Why is that concept such a big part of this project? Julian Millie: I work with colleagues at the State Islamic University in Bandung. A couple of years ago, students in the Islamic predication program helped us do a survey about the features that made preaching successful amongst West Javanese audiences. They went to their home villages in West Java, and came back with their reports. According to almost all of these surveys, a sermon was successful if the preacher was able to hold the audience’s attention for its duration…in other words, the students regarded a captivating sermon as a successful one. Birgit Braeuchler: Okay, but surely this is controversial…I mean, the diversity of preaching styles in Indonesia is amazing, and surely not everybody is happy with the popularity of some of the preaching types mentioned in your book, such as child preachers, Chinese-convert preachers, ex-rock star preachers and so on? Julian Millie: Absolutely…this was something I have explored quite deeply in the book. There are Islamic rationalisations, based on textual norms, that disapprove of skilful preaching, but these are not the main objections. In fact, the main objection to flashy preaching is made on the grounds that it prevents Islam from being a beneficial influence in society. These critiques, generally produced by academics and activists, focus on people’s sensory and emotional responses to preachers. The laughing and crying of listeners is held against the medium as a useful thing. Many West Javanese Muslims are deeply convinced that Islamic projects can lead to progress in social and political problems, and to them, all that enjoyment signals something is going wrong. So the main objections to artifice in sermons is based, I conclude, on concern for a progressive public subjectivity. Birgit Braeuchler: But only elites are concerned with concepts like subjectivity! Julian Millie: Of course…for the mass of West Javanese Muslims, a good preacher is one who conveys Islamic learning, but who does so in captivating ways. When communities hold a celebration, say for the Prophet’s birthday or a circumcision, or something like that, they know that a skilful preacher will fill the venue, drawing young and old. This participation signals a successful event for them, but not for people who connect Islam to progressive social and political projects. Birgit Braeuchler: So, am I hearing that Hearing Allah’s Call is a book about village Islam? Julian Millie: Not at all. What really surprised me was how preachers have such high access to so-called ‘modern’ settings like corporate premises, municipal institutions, educational institutions and so on. This is something I observed in Bandung, the capital of West Java. People there are strongly committed to public displays of piety, so they have moved Islamic routines into these ‘secular’ sites, and it is mainly preachers who are the agents of this. Of course this calls for a special kind of preaching, for these are heterogeneous audiences, but preachers who are skilled at captivating these audiences know how to step around potential divisions. Birgit Braeuchler: You have a chapter specifically on women as listeners. Why? Julian Millie: The case of women listeners is probably the most important example of the way the preaching voice accommodates listeners in their actual situations. It is to do with mobility. In comparison with men, West Javanese women cannot enjoy as many public activities, but in attending preaching and other religious events, they enjoy a relatively high level of mobility. So preaching is a significant element of women’s lives, not just as a pious exercise, but also as a less regulated social experience. And the preachers who specialise in women’s preferences go out of their way to do so in ways that respect women’s preferences. Birgit Braeuchler: A final question, and I am bit reluctant to ask it, but what about the extremism issue? In the west, the image of the firebrand, radical preacher is a strong one, and West Java certainly has its radicals. Did you encounter much of this? Julian Millie: Muslims enjoy preaching in the usual routines of everyday life. To listen to radical sermons, people generally have to go out of their usual routines and attend events held by activist organisations, and most people aren’t really interested in doing this. Apart from that, there is limited interested in the ideas that are promoted at these events, which can be conflictual ones. But we need to bear in mind that 97% of people in West Java are Muslims, so the general orientation of public expression is not the same as it is here, I mean… West Java is not Glen Iris! On some issues, there is public assent to positions that contrast greatly with what we are used to here. As for the terrorism side of it, it is not something that has a public presence. There are strong norms against violence in these communities, so that stuff is underground, just as it is elsewhere in the world at the moment.